It was always going to be the case that I purchased a running buggy. 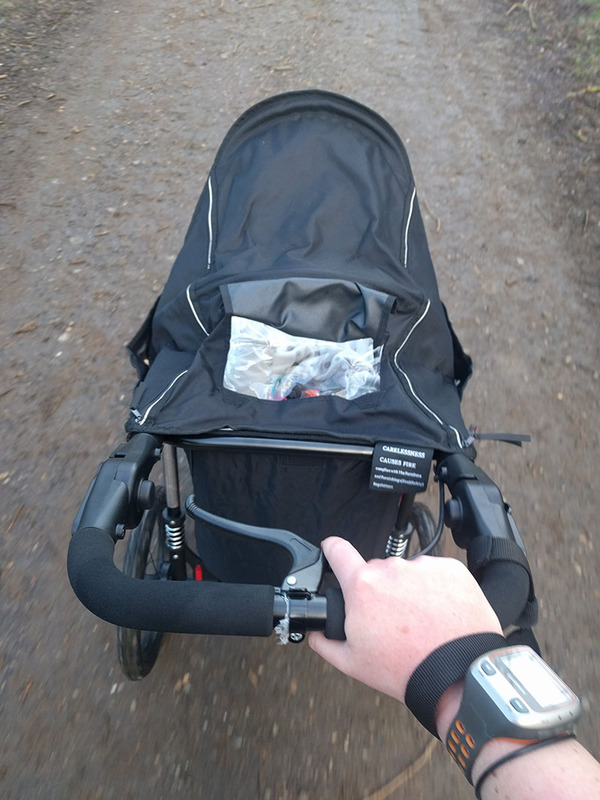 Despite saying during pregnancy that I thought I probably wanted to keep running as my ‘me time’ during the week, having a running buggy makes it so much more practical to fit runs in since Oscar arrived and it helps me remain a regular attendee at parkrun on a Saturday morning. 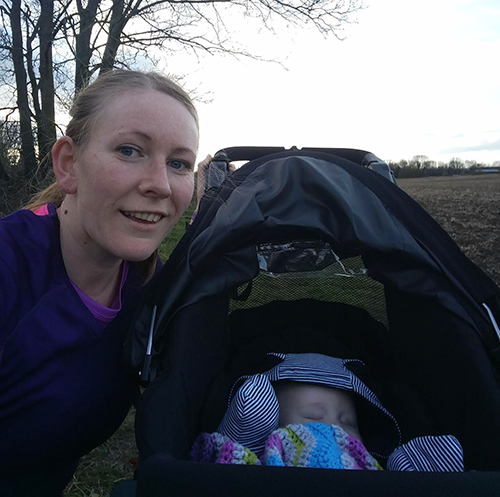 When Oscar was just a few weeks old, a friend from my running club told me about Wendy from Running Buggies coming to Stanwick Lakes the following week. She was going to be demonstrating some of the different running buggies that her business sold and be on hand to offer advice to buggy runners. 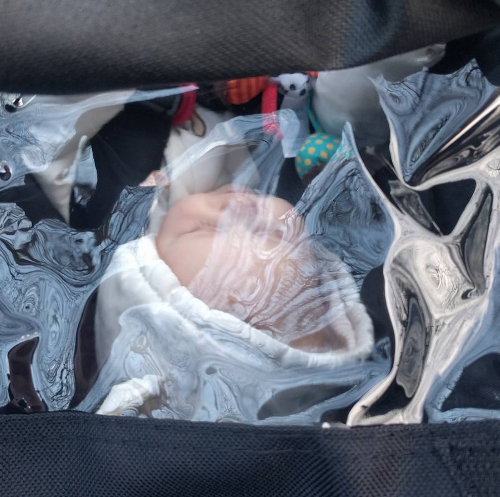 I think it might have been my very first trip out on my own with Oscar in the car at that point, and I still had no clue what I was doing as a Mum with a new baby (do we ever really know?!) but I was determined to get to Stanwick Lakes, just 2 miles up the road and a regular running haunt for me – as I felt it would be so helpful to view the buggies in person and to be able to chat to other Mums as well as Wendy, who had a wealth of knowledge about the different buggies available. The day before the event I messaged to say that I would be going along and Wendy asked what my requirements were in a buggy. I told her that I would mainly be running short distances with the buggy – plenty of parkruns and runs around an hour in length, including some off road running. The buggy wouldn’t be used for town trips, but would potentially also be used for weekend walks in the countryside. 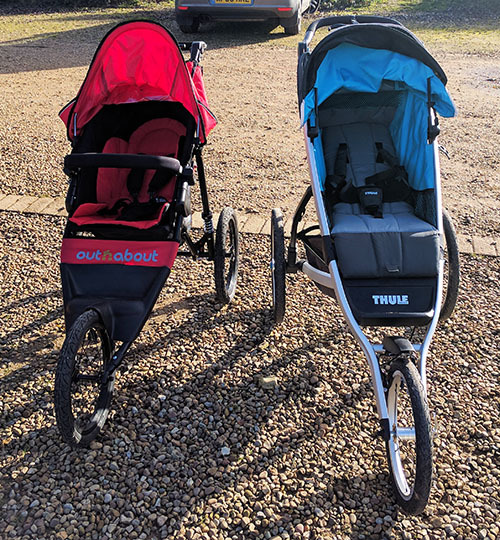 The two buggies which she suggested I try out that (very cold) Friday morning were the Thule Glide and the Out ‘n’ About Nipper Sport V4. Both would be suitable for my requirements, with the Out ‘n’ About weighing in slightly heavier and the Thule sporting a larger price tag. Wendy helpfully held Oscar for me (and found an extra blanket to wrap him in as I was totally unprepared for the chilly wind that was raging that morning!) so that I may run along the track (childless!) and test out each of the two buggies. Although I didn’t purchase a buggy immediately following that visit, I took sets of information packs home with me to weigh up my options and check my bank balance ready for the day I inevitably did purchase a buggy. Had it not been for Wendy putting on an event I wouldn’t have known where to begin when it came to testing out running buggies or knowing the difference between all the makes and models. 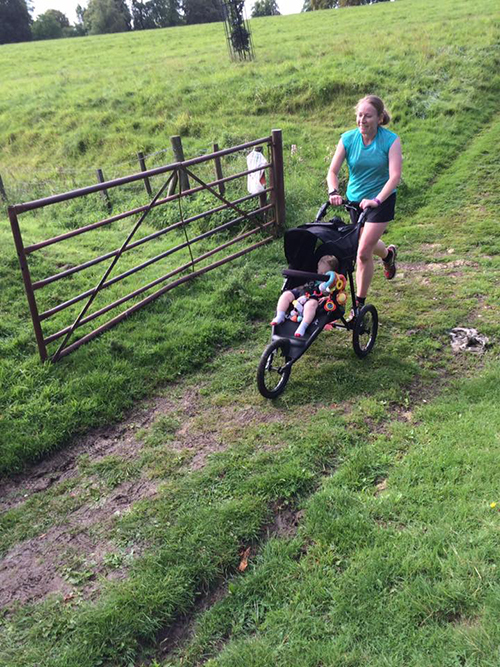 Where do you go to try out a running buggy?! I had assumed that all three wheeled buggies were suitable for running and in all conditions, but that is not the case at all. 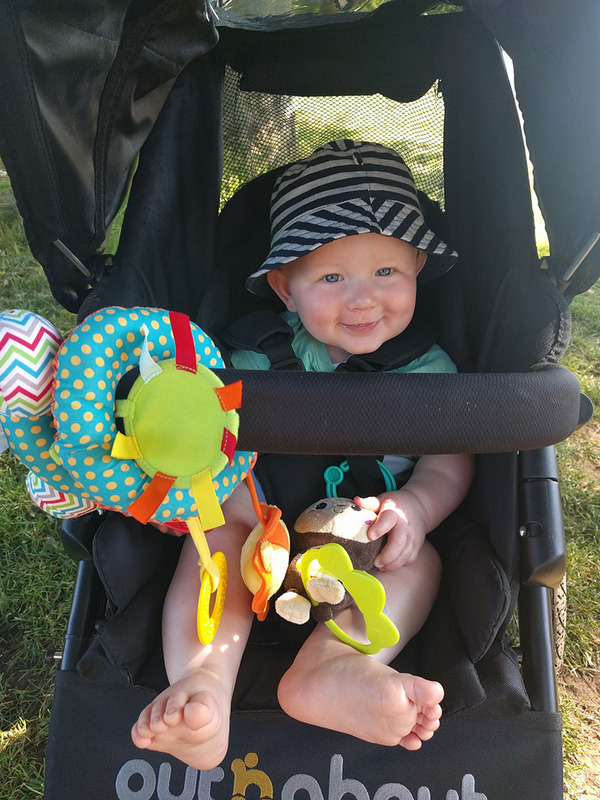 It is recommended that you do not run with a baby in a buggy, even a dedicated running buggy, until they are at least six months old and capable of holding their own head up confidently. Similar to the time that you are confident in placing them in a high chair at the table with you for dinner. Just before Oscar turned six months old I spoke to Wendy again. She was headed back up to my side of the country and offered to bring along a couple of buggies for me to try out now that I would be able to test them out with Oscar as passenger. I thanked her for her kind offer but had already decided to invest in the Out ‘n’ About Nipper by this point, so headed over to her website to make my purchase. I can easily take Oscar out on walks so that we may both enjoy the fresh air along bridleways and footpaths – some tracks which a regular buggy would not be able to cope with. I can fit in runs during the daytime when I’m a lone parent, or during weeks when Dan is working away from home and I otherwise would not be able to run. I can run Oscar to sleep on all those days when he refuses to take a nap! When Oscar was about 3 or 4 months old I liked to take him out for a walk every day in his day-to-day buggy. 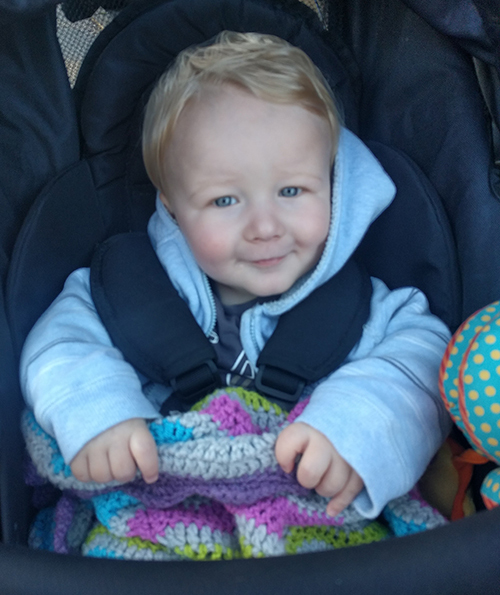 I vividly remember walking along a wide rocky gravel track and Oscar crying so much from the movement of the buggy that I ended up picking him up and placing him on my shoulder to calm him, whilst awkwardly pushing the heavy buggy along with my other hand. 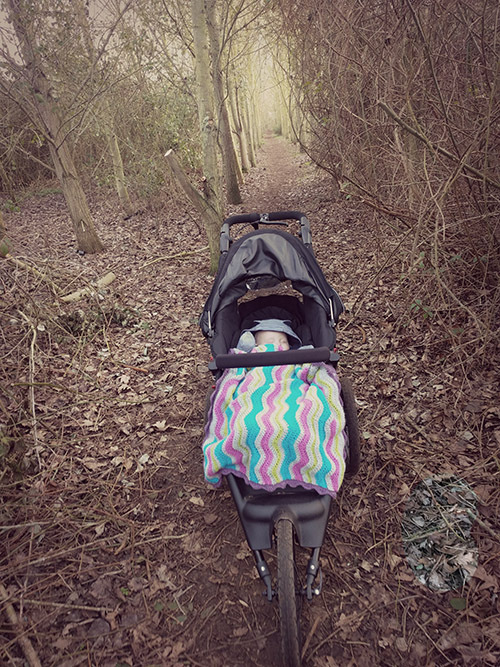 I regularly run down this gravelly track now with my Out ‘n’ About buggy whilst Oscar snores away inside! Alongside the handlebar is a handbrake. I always make sure to have my hand close to this when running downhill! These are great for holding my phone and keys when I run, so that they’re easy to grab should I need them. Although Oscar could sit up unaided from about five months old, I still always made sure to place an array of cushions behind him when he was on the floor during the early days, as he wasn’t always that stable! 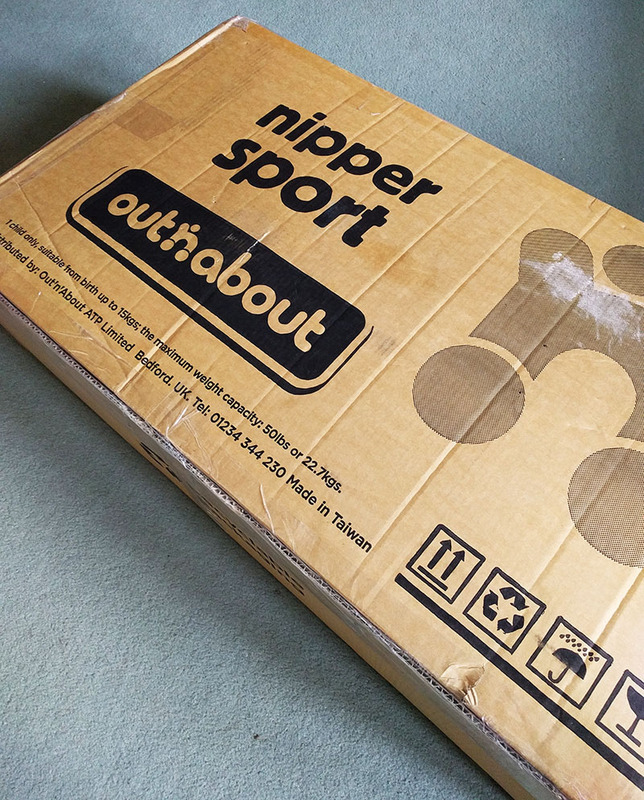 The back of the Out ‘n’ About Nipper can be adjusted so that it reclines and this is how I used it when we first started out running together. Now that Oscar is older, he wants to be able to see where he’s going all the time so I’ve adjusted the back to a more upright position. Following my Caesarean, when Dan returned to work I remained housebound for several weeks as I could not lift or turn the original buggy we owned. The difference in weight between that buggy and the running buggy is very noticeable, and I am able to hold the Out ‘n’ About easily with just one hand. I’m fairly tall so have the handlebar set at it’s highest setting. My friend Jenny is much shorter than me and when I was unable to collect Oscar from nursery one day last Summer she was able to adjust the handlebar so that pushing the buggy became more comfortable for her. Every non-runner comments on the size of these! This takes some getting used to. My brother still complains that he finds it impossible to push Oscar’s running buggy when out on a walk, but it’s really not difficult when you’re used to it. All running buggies should have fixed wheels. 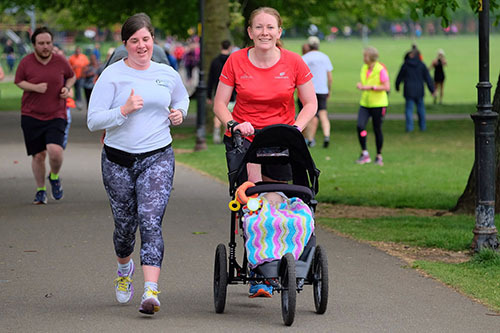 If you were running along with a regular buggy which has front wheels which twist and your front wheel hit a large stone, causing the wheel to twist quickly to the side you could soon end up heading into the road, or into other runners if you were at a parkrun or race. When turning a buggy with a fixed wheel, the way to change direction is to lightly put pressure on the handlebar at the back of the buggy, resulting in the (very light) front wheel lifting from the ground. You can then angle the buggy in the direction you want to be headed before returning the front wheel to the ground again. Sounds complicated and slow, but very quick easy after a few tries. The foot brake is located at the back of the buggy and is bright red, so impossible to miss. It’s a quite large plastic flap, which is really easy to push down and up again when you want to remove the brake to continue on with your journey. I choose to leave the back seats down on one side in my car, meaning I can literally just throw the buggy into the back of the car and drive off when I want to head out, with the buggy ready to go as soon as I arrive at my destination. If we travel in Dan’s car, Dan likes to keep the buggy within his boot, but it takes just seconds to unscrew and pop off the front wheel, meaning that it easily fits widthways in the back of his car. 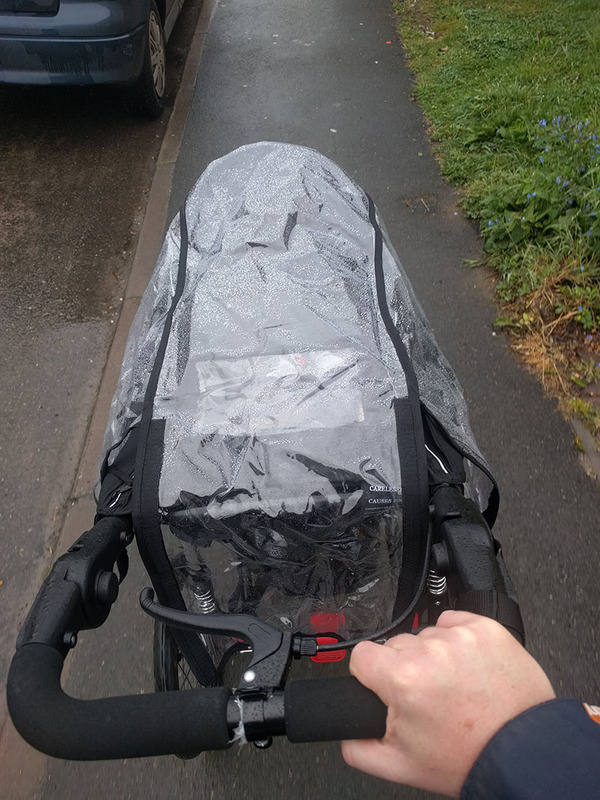 I’ve had to use the rain cover a few times whilst out on a run now and found the cover so quick and easy to throw over the buggy. 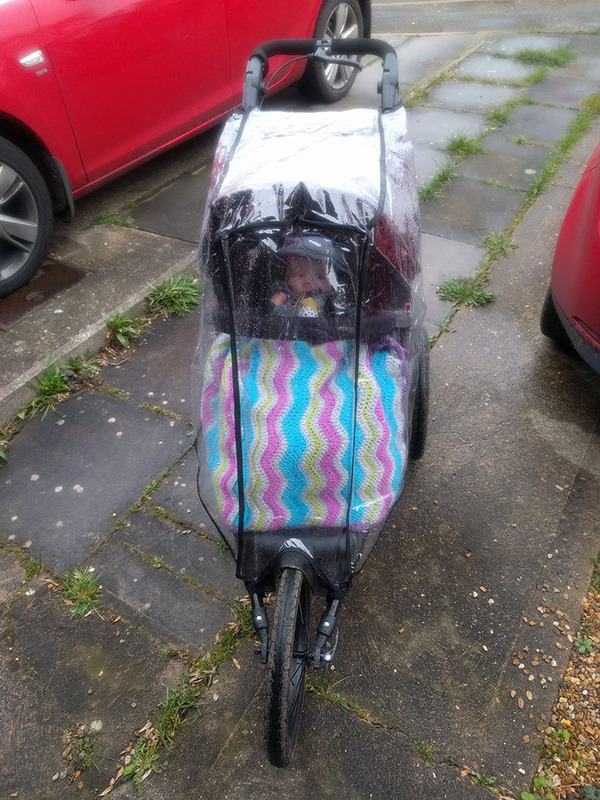 There is a large velcro strip which runs along the back of the cover, and two sets of poppers which attach around the front wheel support to keep the cover in place. Oscar sleeps through the whole thing! Not only does this mean that the buggy doesn’t become so stuffy in the hot Summer months, but it also helps to make the buggy more aerodynamic when you want to pick up some speed. Very handy to spot when Oscar is falling asleep, or when he is munching on falling leaves he shouldn’t have in there with him! You can also buy footmuffs for the buggy, which look super snug, but I love this blanket which my friend crocheted for Oscar not long after he was born. It’s super colourful and you can definitely see us coming on a run! So what does Oscar think? I’m pretty sure he loves it. He spends most parkruns waving madly at people as we run by. Just recently he’s also added the phrase “Bye bye” to the wave. I really hope that nobody thinks I’m sarcastically commenting on the fact that we’re passing them, and instead realise that it is my child waving and commenting as we run by! 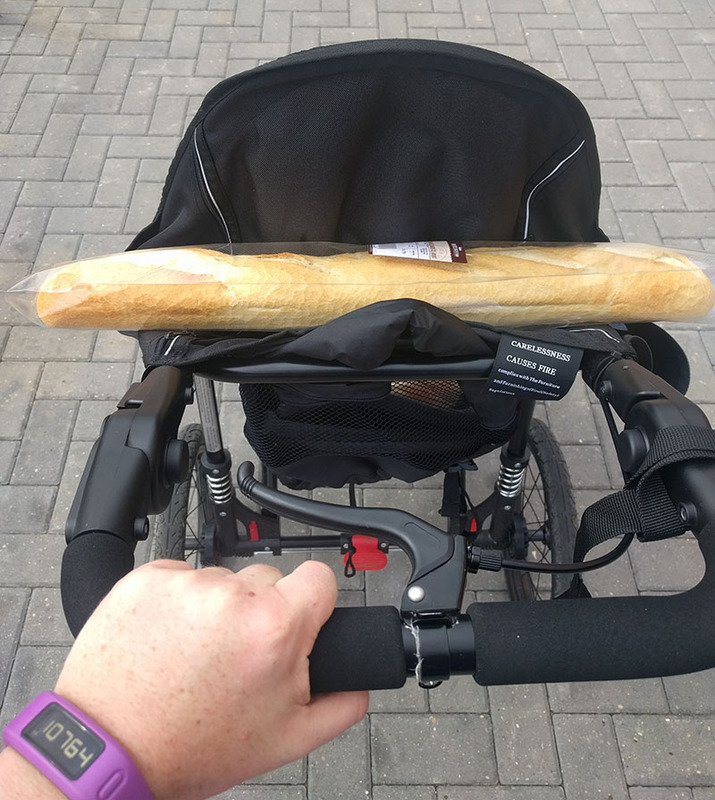 For someone who isn’t in the market for a running buggy, this was interesting to read- I had no idea you had to consider so many thing- the wrist strap is such a great idea. I didn’t have a clue before having Oscar! I’m definitely not in the market for a running buggy but the buggy you have looks pretty awesome! It has everything you need, and some things I didn’t know you needed! 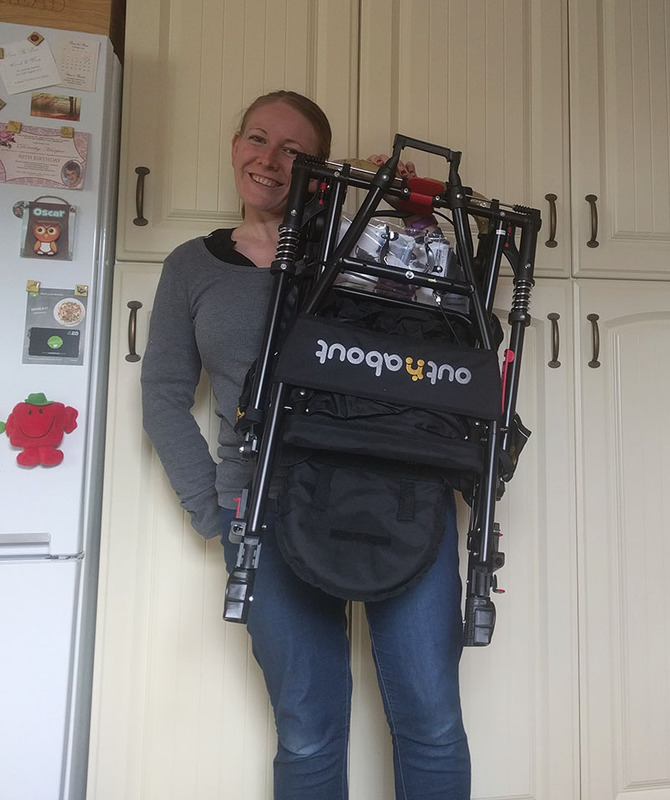 I’m glad that running with a buggy isn’t a new thing, and that other runners have tried and tested and improved the buggy with all these essentials, because I seriously would not have even thought about half of this stuff otherwise! Ah that’s fantastic! I hope you enjoy your parkrun tomorrow. Let me know how you get on with the buggy. We wouldn’t be without ours now.